Want to fly through the water and look damn good while doing it? Boom, you have found your new board. 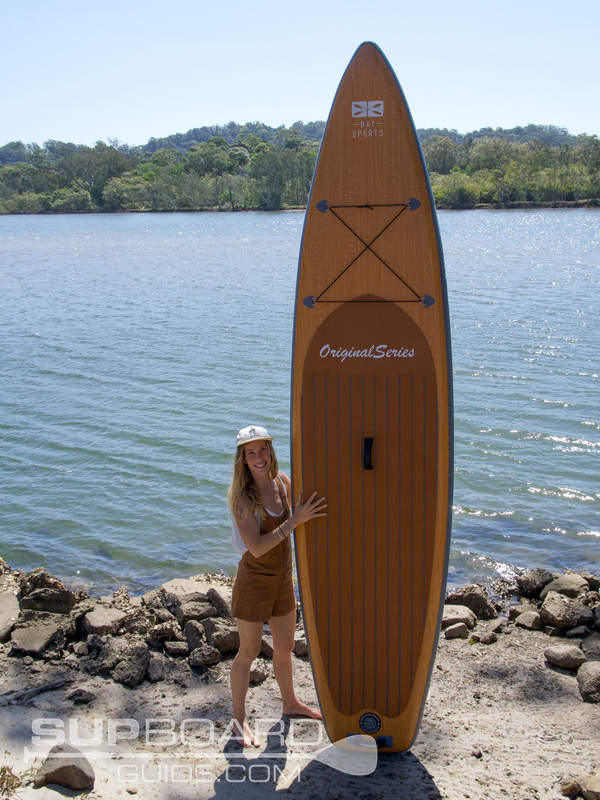 The whopping 11’6” touring board from Bay Sports latest original series range, is not only a beautiful board to admire, but it also flies through the water while still offering stability. 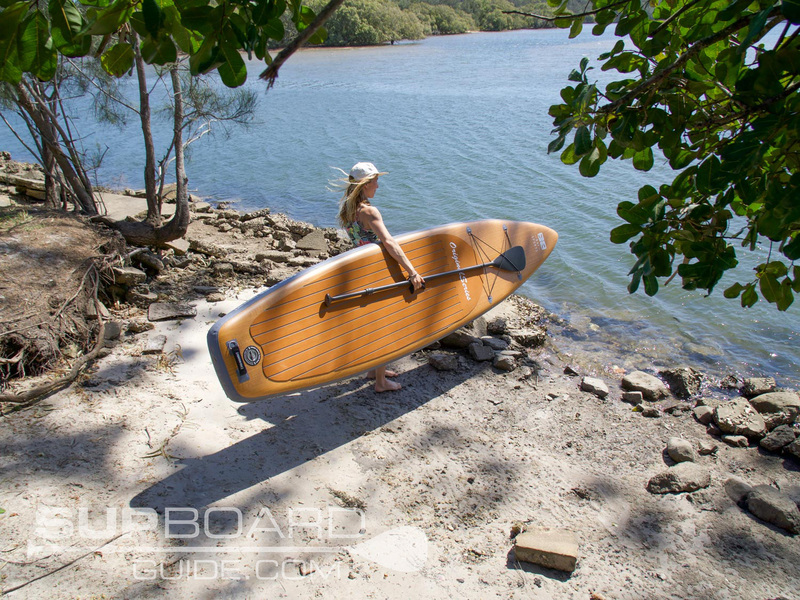 Bay Sports a company in Australia, (ships some places overseas) is quickly charging the market with competitive boards that challenge their competition in not only looks but cost too. Read on to why I loved this board so much! I can honestly say this has to be one the most fun boards I’ve paddled all year. So much so that I chose it to make the 10km paddle from a town nearby mine Mullum to another beachside town Brunswick Heads. With an array of boards to choose from, I’m not going to make a light decision for such a long paddle. When I say fun, I’m talking about how well it goes in what conditions it’s intended for. So the first few paddles I took the 11’6” out down a river and a large lake seeing as it’s a touring board. It was the glide, speed, and stability that sold it for me. It can be hard to match stability for easy paddling without compromising on speed. Though I believe the new Connect II fins that Bay Sports are using, have improved tracking so much so you can really get going. Using 6” thickness provides the stable platform as well as the 34” wide base you stand upon. Though combined with the tailored nose and slightly pulled back tail, you get a streamline effect happening in the water that has you cutting slices through water easier than a machete through bread. 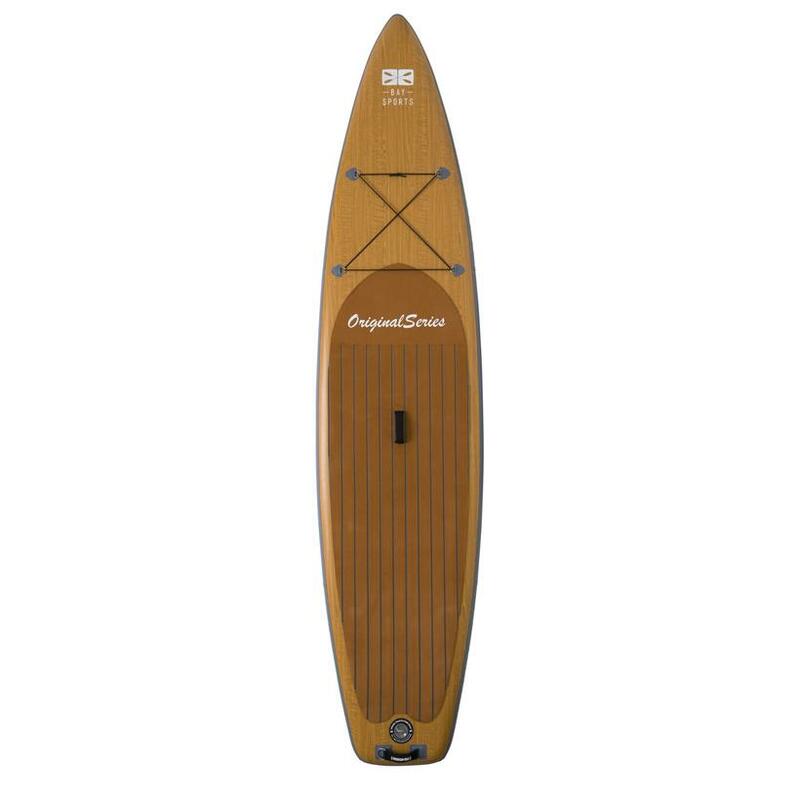 So as a touring board it really excels, comfortable to be on for long periods, picks up speed and easy to paddle with the included carbon fiber paddle. Though this is also a great family board having so much surface area. You can easily take a child or dog with you, even do some yoga! I love the versatile performance because I know it would be a great beginners board but still a fun board to paddle as someone more experienced. 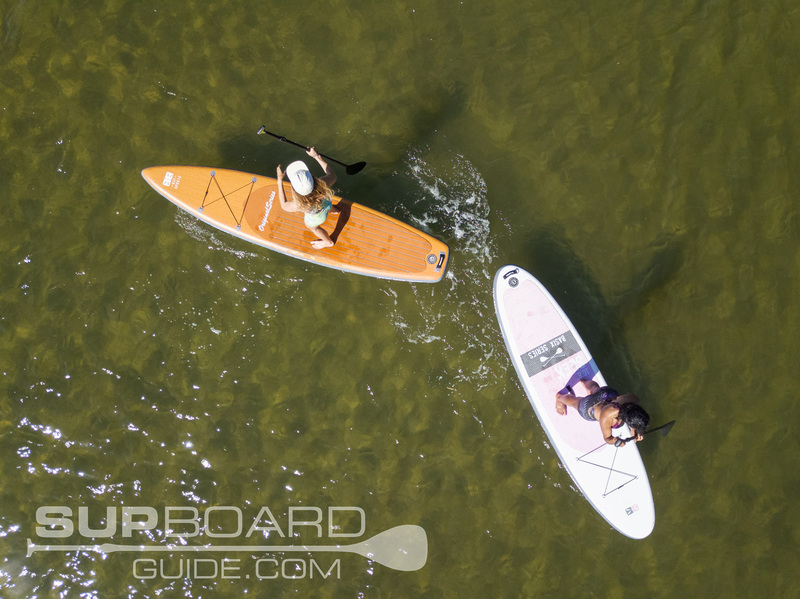 At the center of every BaySports board, well every inflatable SUP, in fact, is a drop stitch core. Encasing that core is layers of PVC that have been fused together using Bay Sports own Fusion Tec. What I love about this process on the 11’6″ Original Series particularly is that most 6″ board don’t use fusion. Fusion layers so far, as I have experienced have been reserved for boards between 4″ and 6″ thick. So to have a 6″ thick board but use Fusion, you get a phenomenally stable board. If you want to read up the full info on the materials used when making the 11’6″ Original Series Tour, you can head over here to Bay Sports own explanation. 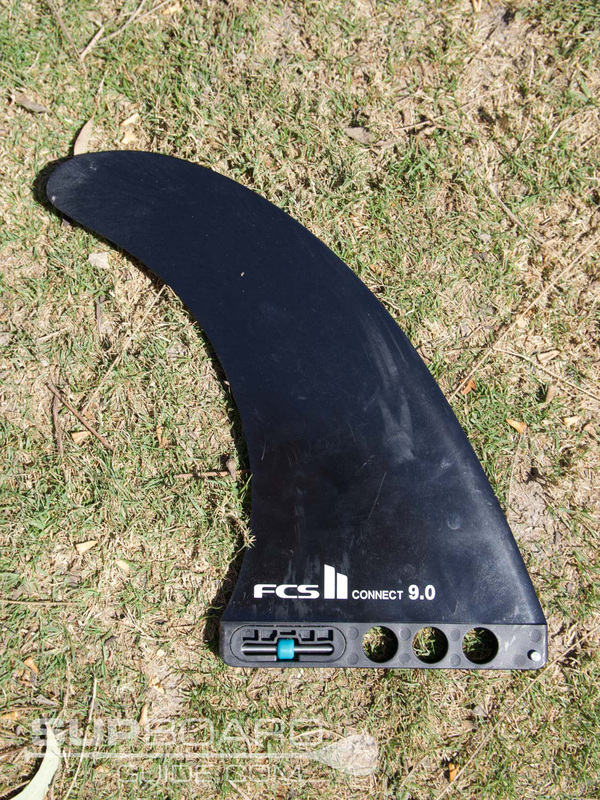 Connecting you to the core ability to turn and glide is your FCS Connect II center fin. It’s 9″ of awesome. Gone are the days of fiddling with a screw and plate…also losing them (Guilty!). Now it’s not just the fact it’s a totally toolless system that makes me happy. It’s the quality of materials too. You can find toolless fins on other boards such as the iRocker range. However, given that an iRocker is only about half the price, the plastic used is a little cheaper and the shape more generic. These 9″ fins are strong and have a defined dorsal shape that cuts you through the water with ease, increasing your glide. The other thing I noticed was how much more controlled and sharp the turns were. The side fins are fixed and made from molded plastic. These kinds of fins can take a beating! If they are a little curled when you first get your SUP, you can either leave it in the sun or pour hot water over the fins. They will go back to shape! When you are storing your board, you can also use the fin protectors come arm floaty looking things which are included in the package. If you aren’t already impressed by the board itself, you will be by the pump. 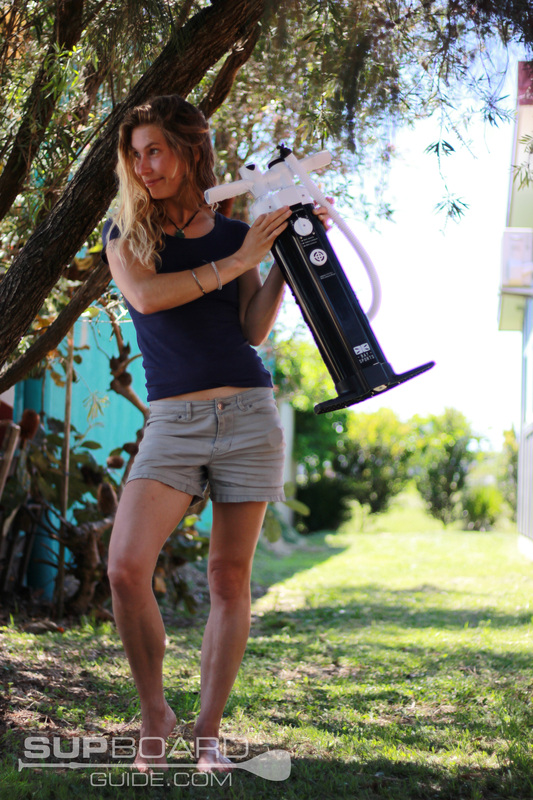 Inflating became 10X easier with the inclusion of the double chamber, triple action pump. I would bet I inflated it approx 4-5 mins and in one go, no breaks! Deflating is a simple task as always, pushing the pin in and twisting to lock off. Locking off means air can continue to escape as you roll up your SUP! Well, normally I would start with how the shape of the board affects the performance/stability. But I just can’t start without talking about the obvious, how pretty this board is! Yeah yeah, I know such a girl thing to say. I felt like I was in some sort of photoshoot paddling my wooden look deck down the river lined by towering trees and mooing cows. They’ve really nailed the wooden deck look, sometimes if it’s a cheap print, the graphics look fuzzy but not on the Tour! The matching of the deep brown deck pad is the perfect accompaniment. But, moving onto the actual design of the board itself. Now, this is the same length and width as the Signature Series 11’6″ Tour, so I wasn’t expecting too much of a difference to the way it paddled. 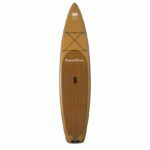 Both boards pick up speed quickly thanks to the narrow nose but also provide a maximum amount of stability through the squared tail. Though this Original Series is slightly thicker than the Signature. So I found it to be a little more stable again but not so bouncy like many other 6″ thanks to still using Fusion Tec. Moving the board around is easy with the handle in the middle and at the tail, though I would like to see one more handle on the nose. Given this is a very large board at 11’6″ long, I know some people would struggle to carry it on their own. One more handle on the nose would be helpful! Also, an additional 2 D-rings with more bungee cord for a little more storage would be ideal. Though what storage already exists, is plenty for a couple hours out, I found it to be a little limiting for my full day expedition. 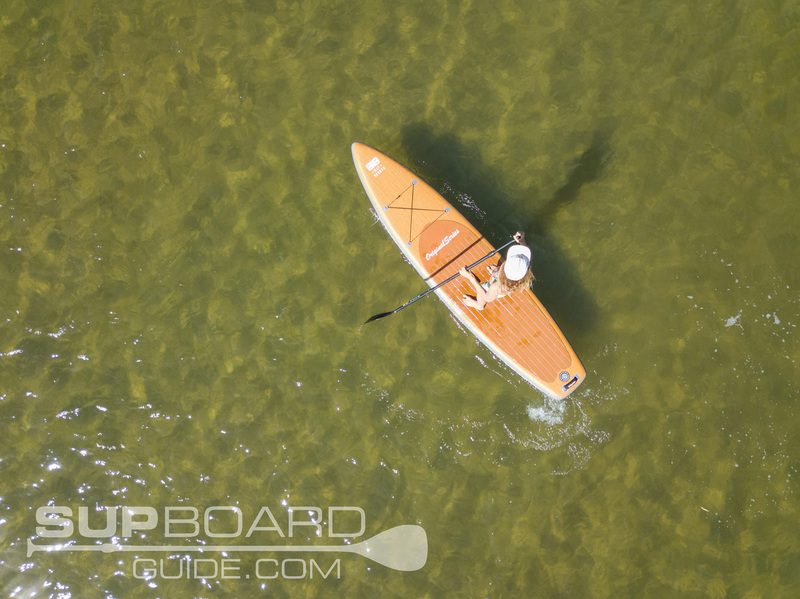 Propelling you through the water is your full fiberglass paddle. 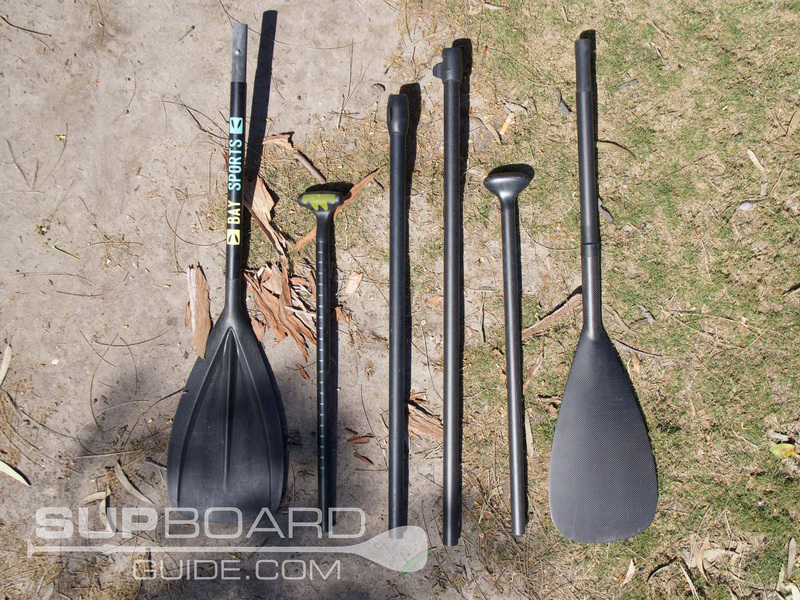 Which is an upgrade on the part fiberglass/plastic paddle from previous models. It’s also got a slightly smaller paddle blade that pulls through the water effortlessly and with minimal flutter. I would like to see a bit more grip on the handle, but aside from that, I found it to be a fantastic lightweight (700g) paddle. No wobbles at the joints, which I’m very happy for, after recently losing a paddle blade mid 10km paddle. Welcome the newest addition to BaySports packages. Their triple action, dual chamber high-pressure pump. It’s on par with RPC Titan with quality and efficiency. 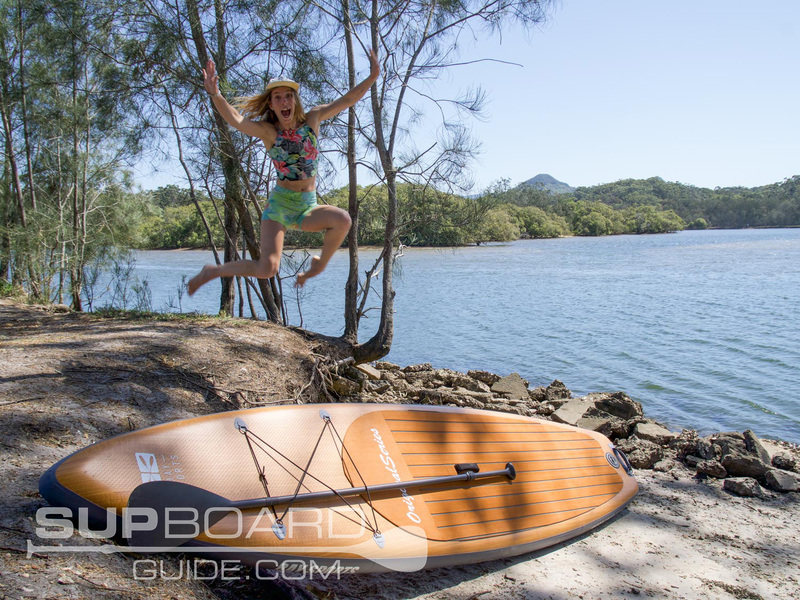 If you’ve blown up an inflatable SUP before you would know that it can be quite the task. Now, if you have a decent pump that task can go from arduous to simple! Other points to note about the pump are its ease of use and secure hose fitting. It’s easy to do a good pump but takes special thought and dedication to make a great pump. Snugging comfortable and securely around your ankle is your leash. Included on the leash is a secret stash spot for your keys. If you haven’t noticed already, I much prefer these coiled leashes. The main reason being that they lessen the chance of your leash dragging in the water and getting caught on submerged objects. 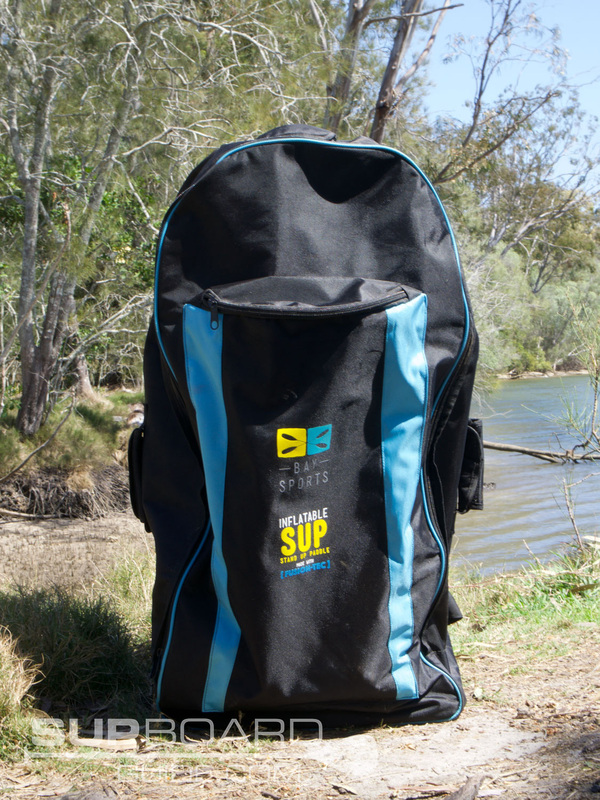 Now to make carrying all your gear from home to waters edge easier, you are supplied with the BaySports backpack. On this bag, you can find comfortable straps and extra pockets for all your goodies. The material feels strong and rip resistant as well as being able to breathe a little. Getting your board in and out of the bag is no problem thanks to the zips pulling down the whole way and there being loads of extra space inside. Really as a “just in case” is your repair kit. Inside you’ll find the standard patches, glue and valve wrench tool. Again, I’ve not yet ever had to use a repair kit. Though if I ever do, I’ll be very grateful! Beats taking the board to a shop for a few weeks! 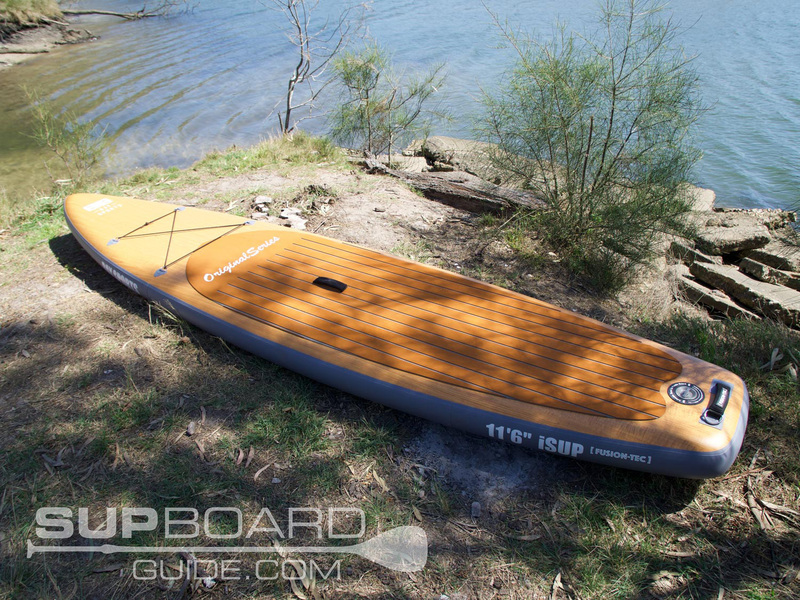 If you’ve wanted to get yourself a touring SUP, I can’t recommend this one enough. Not only for its aesthetics but its performance as well as value for the cost. It might get me in trouble saying it, but it’s one of my absolute favorite boards I’ve ridden this year. As far as who this board suits, it’s definitely a crowd pleaser. The size and shape provide enough stability for beginners while still holding enough performance for intermediates too. Using innovative technology in the manufacturing process means an increase in weight capacity which aids in two ways. One it’s entirely plausible for more than one person to be on board and two, it’s going to be stable for even the bigger riders. Those looking for more stability or to take a bigger load, say to go fishing, you can check out the Blackfin Models. They are some of the most stable boards on the market though just a note, they’re also a little heavier. For those, after a slightly more versatile board, you should check out all-around options. If you are wanting to stick to this same price range, BaySports also have their BasiX Series and also very similar is the ERS Skylake. As far as warranty and customer service goes, BaySports are ahead in the game. They are offering a 3-year warranty on their SUPs and will usually get back to you same day with any questions or concerns. Keep in mind too that though are an Australian company they ship overseas! Thanks for the review. 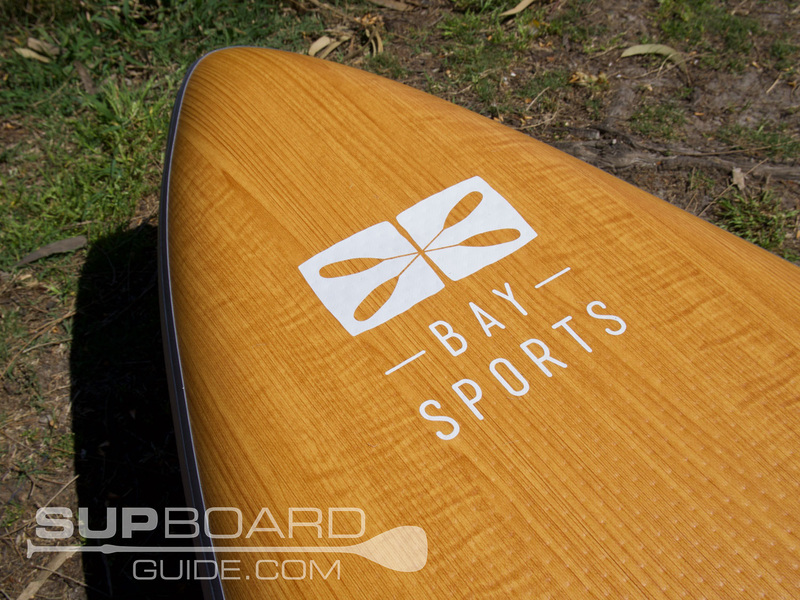 How does it compare to Bay Sports Tour board in terms of ride, handling, feel, tracking … etc? Sorry just need to clarify, do you mean the other Tour board I’ve reviewed of theirs? Or was that a typo and you mean to write a different board haha let me know and I’ll let you know! The other Bay Sports Tour board, being 5″ thick but with Fusion Tech. I’m deciding between the Bay Sports and the iRocker. Unfortunately, Australia only stocks the older 2017 iRockers. This 6″ thick version (Original Series) also uses Fusion! The only board I’ve come across so far that uses Fusion and is 6″ thick too. I found the Original Series (Here on out I’ll refer to the OS) to obviously be a little more stable being thicker and wider. However, speed wise and tracking the OS is actually better. I honestly have to put it down to the FCS Connect II fin, a good fin makes a big difference. Now, I haven’t yet put the same fin in the Signature Series (SS). So that could potentially make the SS performance boost. I like having a little more stability though, because this type of touring board, I like to use long distances so I want to be comfortable. The difference in speed/maneuvering I feel would be so small that it’s not a huge compromise. I also just like how the OS looks…it’s prettier. ha. You definitely get a much better board/accessories etc with Baysports than with iRocker but obviously an increase in price too. And I know 🙁 I have emailed them a couple of times asking when the new stuff will be available in Australia for the public! Time will tell, you’ll be sure I announce something when it happens. Other inflatables available are Red Paddle Co but that’s a jump in price. Also I’ve seen AirBoardCo and Sunny High King use reasonable materials but I have no experience with their products yet. Otherwise, I’ve seen a few cheaper brands that I don’t remember the names of now ( I can tell they’re cheap looking at them haha) things you can get in Aldi, sports stores etc..but I wouldn’t recommend spending the money on them.